Cinnamon Fern has medium green somewhat coarse foliage. The fertile fronds are cinnamon colored, and very upright. Osmunda cinnamomea is very wet site tolerant, and a deciduous creeper. Great in rain gardens. 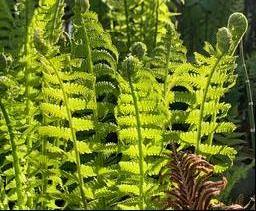 Royal Fern is a tall broad fronded fern that thrives in wet, shady sites. 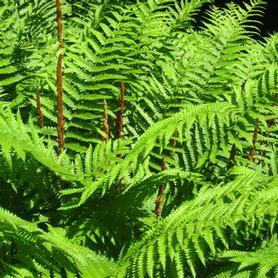 At 48", it towers over other native ferns and stands out because of its coarse open texture. 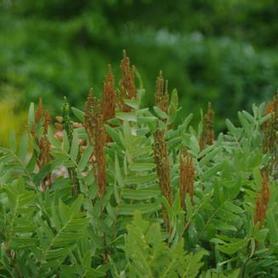 Osmunda regalis is a deciduous spreader, slowly colonizing moist woodland settings. When provided with consistent moisture, Royal Fern ever tolerates full sun. An excellent tall addition to stream sides, ponds, rain gardens and wet meadows.